I wanted to do something summery and delicious for Alzheimer’s Society’s Cupcake Day and thought back to the tinned peaches that we got through in my childhood. Have these fallen out of fashion? I realised it had been an age since I had eaten tinned peaches and decided to revisit them! This recipe can be easily amended to include strawberries in the place of peaches for another summer favourite. To make your Peaches and Cream, beat the butter until soft (best done in a free-standing mixer) and add the icing sugar. Loosen this with a tablespoon of cream cheese and a teaspoon of the best vanilla extract that you can afford. Whip the mixture until light. Drain the peach slices from their tin and pat dry with a kitchen towel. Chop into tiny cubes and fold into the cream mix. The drier the peaches, the better this will work as any excess juice can make the buttercream look a little like it has split and curdled. 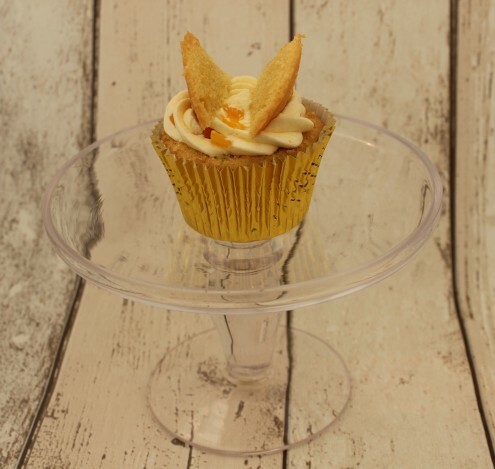 Pipe or dollop a little peaches and cream on the top of your cupcake, immediately sticking the two cut pieces (or ‘butterfly wings’) into the cream.